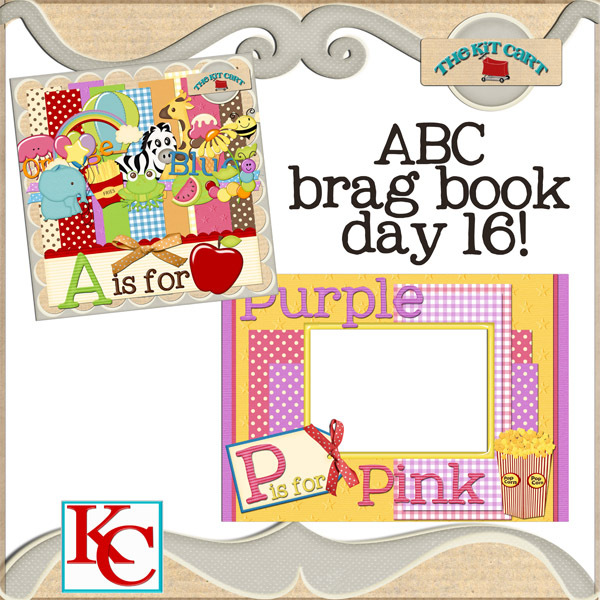 The Kit Cart: ABC BRAG BOOK FREEBIE DAY 16! ABC BRAG BOOK FREEBIE DAY 16! Thank you for all the info and wonderful ideas! I asked because I'm constantly having to clean up my hard drive from large kits (I love other designers stuff, I don't just use my own). So I have been on the hunt lately for smaller kits and then I got to thinking that maybe others felt the same. Those files can get large and fill up a hard drive quick. So I have some thoughts and ideas for what will be coming out in the next few weeks. Here is today's freebie, I'm on my way to the airport to pick up my sister, Yay!! Sorry Download Links Have Expired! thank you so much for the wonderful bb page! Have a wonderful time with your sister! Thank you so much for this post. I want to let you know that I posted a link to your blog in CBH Digital Scrapbooking Freebies (please, notice the new url for my blog), under the Page 13 post on Apr. 27, 2012. Thanks again.